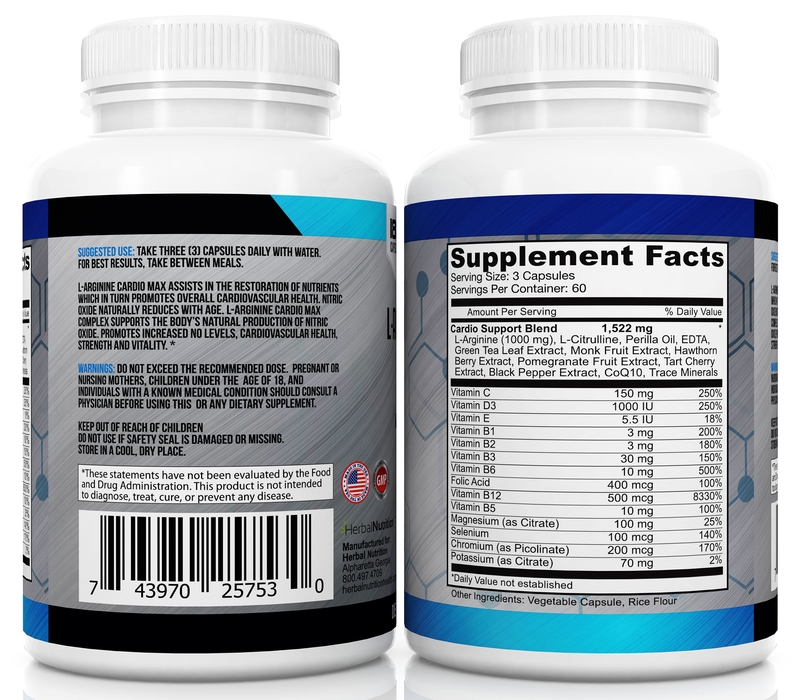 PROPRIETARY CARDIO BLEND · L-Arginine Cardio Max supports cardiovascular and lung health by increasing Nitric Oxide levels and blood flow. 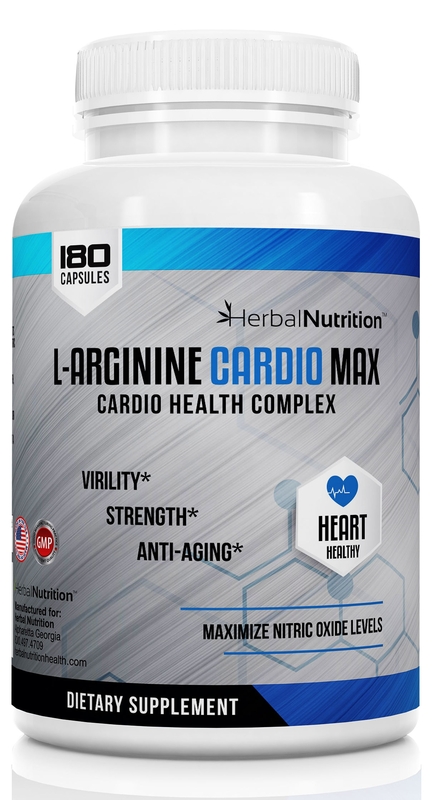 * L-Arginine Cardio Max is a bestselling Arginine formula based on Noble Prize-winning research in the 90's, and the discovery of Nitric Oxide, considered by some as the most important advancement in the fight to maintain blood pressure and overall cardio health. 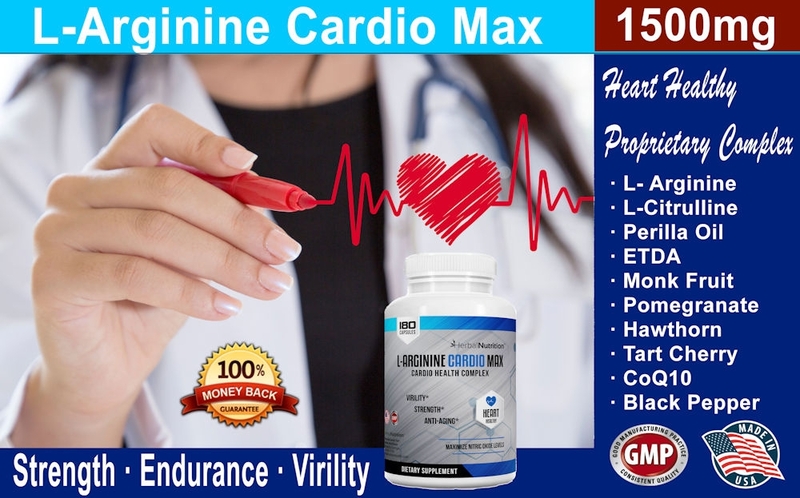 HIGHEST QUALITY AVAILABLE · L-Arginine Cardio Max is Manufactured in the USA by an FDA certified manufacturer, L-Arginine Cardio Max is also tested to insure quality and safety, and then backed by our MONEY BACK SATISFACTION GUARANTEE! YOU CAN TRUST THE HERBAL NUTRITION BRAND! Our goal is to help people improve the quality of their lives, by providing nutritional supplements that will benefit their health and athletic performance. We developed the Herbal Nutrition Brand to deliver only the highest quality supplements and have helped thousands of people achieve their goals for more than a decade! Our commitment to our customers is to provide only the highest quality supplements and exactly what is on the label of our products. All our products are GMP manufactured and tested for quality and authenticity. 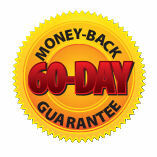 Herbal Nutrition quality is 100% guaranteed. 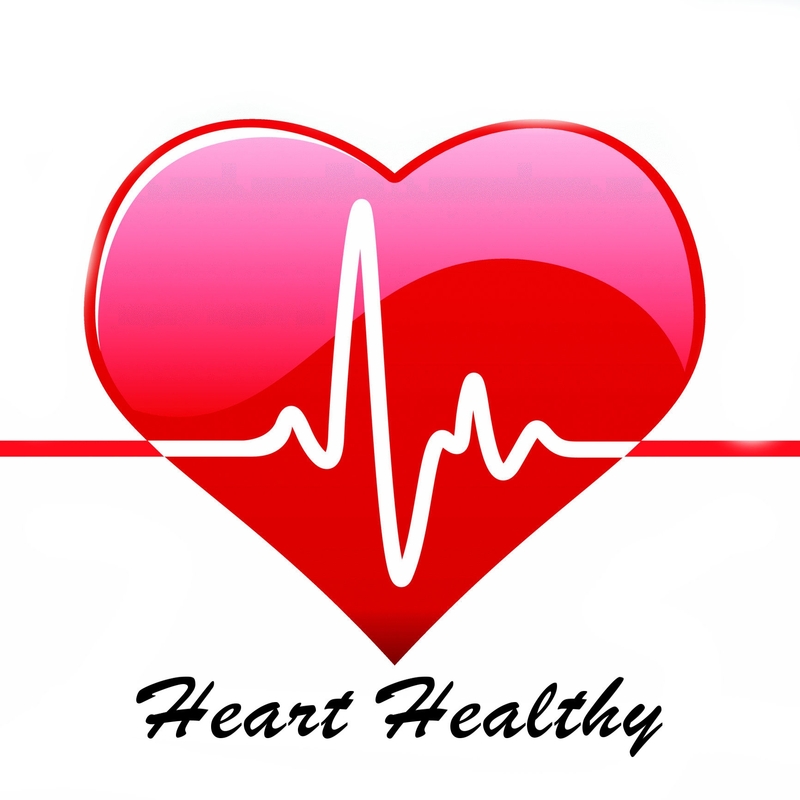 After your purchase we will email you "All About CardioMax", which explains the science behind our proprietary heart healthy complex! Take Three (3) capsules daily with water. For best results, take between meals. Helps me with long work days and training days. 5 stars! primarily bought it to help reduce my slightly elevated blood pressure and it works great! The boost in energy is a definite bonus. I have taken this product for a couple of months and am adding it to my preworkout stack. I noticed much better pump after I had taken this for a week or so. 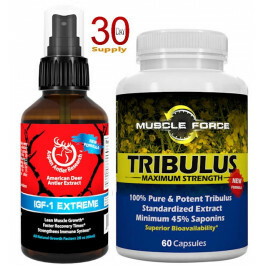 I take C4 and deer antler spray. Now a regular part of my supplement routine. This is hands down the BEST Arginine supplement! I have noticed a difference in endurance and am glad my nutritionist/friend recommended this! Thank you! I have just started taking L-Arginine Cardio Max and feel like it has given me the boost I needed to get through my long days. I have been on it for just over two weeks and will continue to use it daily. I take it first thing in the morning to get my day started. I would highly recommend this. Fantastic product for anyone, especially for those facing cardiovascular issues or wanting a great natural pre-workout supplement! My family history predisposes me to CVD risk by my mid-50's! NO THANKS! I have made serious dietary changes to atone for that, but L Arginine Cardio Max is a vital element in my plan to keep healthy. If you are looking for a natural way to enhance your Cardiovascular health and clear "brain-fog" this is a must. Trust me people its great stuff! I LOVE this product! I take it religiously EVERY DAY. It's so good, My blood pressure is better, I feel better, I breath better, and I have more energy. Go look this up on webMD and you will be AMAZED at what L-Arginine does for your health. On top of that, the manufacturer of this product is customer-focused. They actually called me to make sure I was happy with the product. So, I will continue to use this item, and now I'm a loyal customer of this particular brand. Doesn't get better than that! HIGHLY RECOMMENDED. 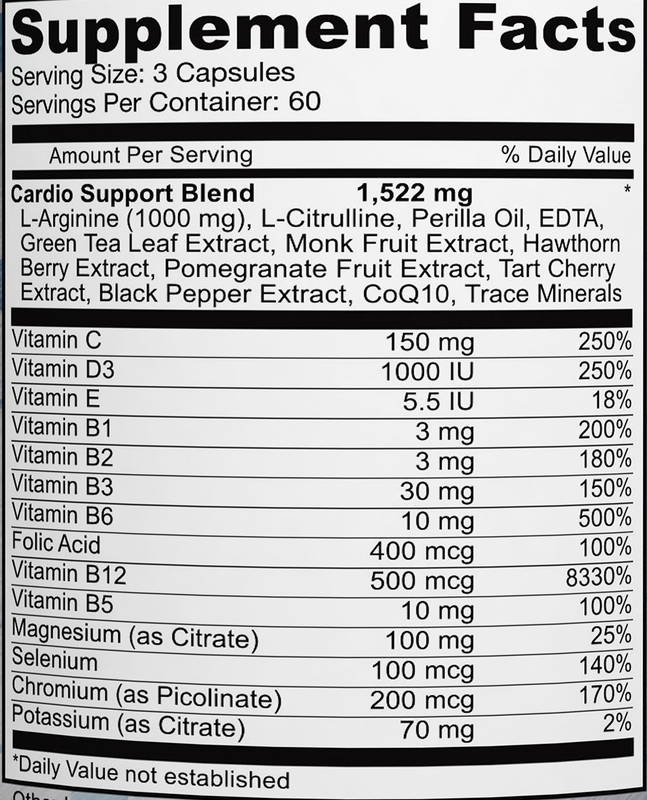 I am extremely satisfied with L-arginine Cardio Max. I was using another arginine product , but it did not give me as much boost as this does. After taking it for a week, was I was feeling peppier, and helped my attitude, and it added more satisfaction in the bedroom, which was a grand plus. Being a 68 year old, I thought those days were waning,but my wife also noticed the difference,to our mutual satisfaction. I would recommend this to my aging friends! Performed as I expected. Will definitely buy this product again. I am 75 years old, work every day 12 - 16 hours. I recommend this product for everyone that is active and wants wide open arteries for maximum blood flow. After using this product for a month, I truly noticed a difference in my energy level during the day. 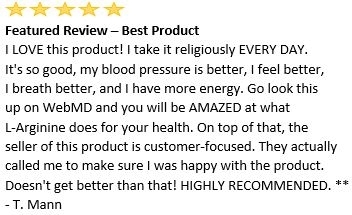 I primarily bought it to help reduce my slightly elevated blood pressure and it works great! The boost in energy is a definite bonus. I tried another product for 2 months prior and didn't notice the benefits that this product has given to me. Therefore, I placed a new order this month and hope to continue ordering it month by month.